John Wayne starred in many western movies and THE ALAMO was a favorite. We fondly remember John Wayne in this beautiful VALUE home. 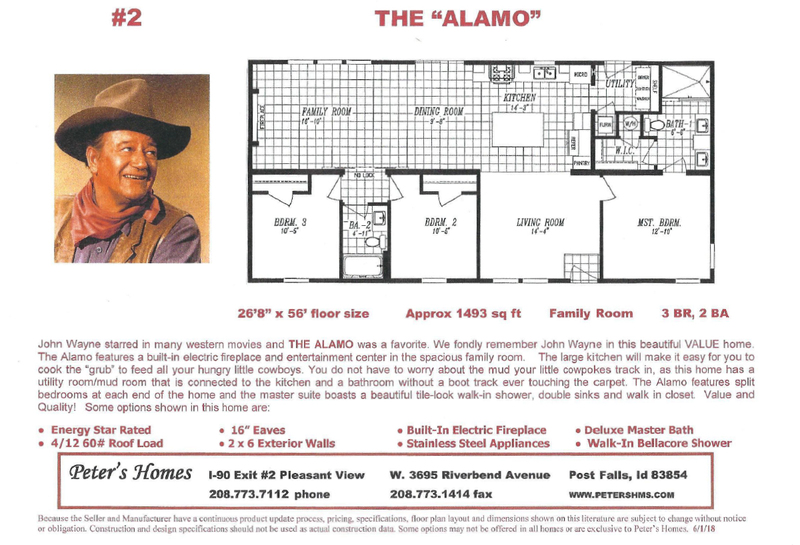 The Alamo features a built-in electric fireplace and entertainment center in the spacious family room. The large kitchen will make it easy for you to cool the "grub" to feed all your hungry little cowboys. You do not have to worry about the mud your little cowpokes track in, as this home has a utilities room/mud room that is connected to the kitchen and a bathroom without a boot track ever touching the carpet. The Alamo features split bedrooms at each end of the home and the master suite boasts a beautiful tile-look walk-in shower, double sinks and walk in closet.